How much Farmland is used for Biofuel? In 2015, the U.S. used 5.25 billion bushels of corn for ethanol production (a biofuel). In the same year, yield based on harvested acres was 168 bushels/acre. However, a yield based on planted acreage would take into account the crop failure rate, giving us a fairer assessment of land use: 153.37 bushels per acre. These figures imply that about 34,230,945 acres were used to grow corn for ethanol in 2015. In 2014, the U.S. used 5.207 billion bushels of corn for ethanol production. In the same year, yield based on planted acreage was 156.9 bushels per acre. These figures imply that about 33,186,743 acres were used to grow corn for ethanol in 2014. 33.187 million acres for ethanol from corn in 2014 in the U.S. In 2014, the U.S. used 7.506 billion pounds of fats (3.4 million metric tonnes), mostly vegetable oils, to produce biodiesel fuel. 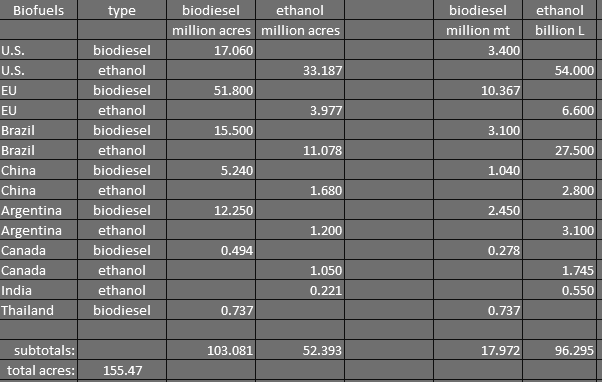 The main feedstocks for biodiesel were soybean oil (4.802 billion lbs), canola oil (1.046 billion lbs), and corn oil (0.97 billion lbs). Calculation of the acreage needed to produce these quantities of oil is as follows. — DM weight times 0.043 for percent of fat, times 0.85 for percent of fat in germ, times 0.95 for extraction efficiency, times 0.95 for amount of final product (refined oil). The above three sources of veg oil for biodiesel total 15.52 million acres of land to produce 6,818 million lbs of biodiesel, which is just shy of 440 lbs per acre. There are a few other minor sources of biodiesel, which brings the total biodiesel (2014) to 7.506 billion pounds. The acreage needed to produce that quantity of fuel at 440 lbs/acre is 17.06 million acres. 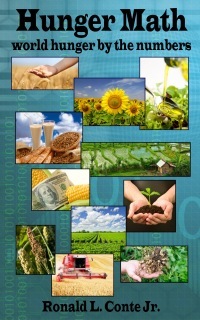 17.06 million acres for biodiesel in the U.S. Note that the production of vegetable oil, whether for food or fuel, results in a solids from the seed which is often used as an ingredient in livestock feed. So the one crop has two products: oil and feed. However, the use of agricultural land to grow livestock feed is an inefficient use of agricultural resources. It is therefore still valid to say that this land should have been used to produce food for humans (directly). In 2014, Brazil produced 27.5 billion liters (7.3 billion gallons) of ethanol from sugarcane feedstock. At 6,134 liters of ethanol per ha of sugarcane, the total land used was 4,483,208 hectares, which is 11,078,006 acres. Unlike corn and various oilseeds, sugarcane occupies the land 12 months of the year. The acreage used to grow biofuel in the U.S. is one crop cycle of about 4 months. The land used to grow sugarcane in Brazil could be used to grow food for three (4-month) crop cycles per year. This factor triples the amount of food that could be produced per acre as compared to land used for corn/ethanol or oilseed/biodiesel. So those 11+ million acres, times 3 crop cycles, are functionally equivalent to 33,234,018 acres (33.2 million acres) times one crop cycle. 11.078 million acres (time three crop cycles) or, 33.2 million acres (times one crop cycle) used to grow sugarcane for ethanol instead of food in Brazil in 2014. Biodiesel is on the increase in Brazil. 2014 saw a total of 3.1 million metric tons of biodiesel, mostly from soybeans, grown in Brazil. At an average 490 kg/ha or 200 kg/acre, this implies about 15.5 million acres of land to produce that quantity of biodiesel. 15.5 million acres for biodiesel in Brazil. In 2013, the EU produces 10.367 Mmt of biodiesel. Assuming a similar yield of biodiesel as in the U.S. (440 lbs/acre or 200 kg/acre or 490 kg/ha), the EU used 51.8 million acres (times one crop cycle) to produce that quantity of biodiesel. 51.8 million acres used to grow biodiesel instead of food in the EU nations. In 2014, the EU grew corn, wheat, other cereals, and sugar beets for use in making fuel ethanol; wheat accounted for 43% of the feedstock used to make fuel ethanol. The total production of ethanol in the EU in 2014 was 6.6 billion liters. Feedstocks for ethanol are also used as an ingredient in livestock feed [at an estimated ratio of 0.5 kg of feed per liter of ethanol]. Feedstocks for European ethanol are 87% from EU crops and the rest from imported crops. The estimated land used for EU-grown feedstocks is 1.4 million hectares , which accounts for 87% of ethanol production at an ethanol yield of 4100 liters/ha. This value is in agreement with the typical amount of ethanol produced per ha of corn: 3,978 to 4,205 liters/ha . Applying the yield of 4100 L/ha to the full ethanol production of 6.6 billion liters gives us 1.61 million hectares of land (3.977 million acres), in the EU and elsewhere, used to produce feedstock for all of the EU’s ethanol production. The 2014 production level of 2.8 billion liters, combined with typical ethanol production per hectare of 4,100 liters for grain feedstocks, implies an approximate land use of 682,926 hectares or 1,687,510 acres. The 2015 estimate of 3 billion liters gives us 731,707 ha or 1,808,048 acres. China also produces substantial amounts of biodiesel, estimated at 1.13 billion liters in 2014. The average specific density of vegetable oil is 0.92, giving us a value of 1.04 billion kg of biodiesel. At an average 490 kg/ha (see above), this implies a land use of about 2.1216 million hectares or 5.24 million acres. Biodiesel is on the increase in Argentina. 2014 saw a total of 2.45 million metric tons of biodiesel. At an average 490 kg/ha or 200 kg/acre, this implies about 12.25 million acres of land to produce that quantity of biodiesel. 12.25 million acres for biodiesel in Argentina. In 2014, fuel ethanol production in Argentina rose to 3.1 billion liters. Argentina produces ethanol mainly from sugarcane. At 6,134 liters of ethanol per ha of sugarcane, the total land used is estimated at 1.2 million acres. As is the case with sugarcane production in Brazil, the land could support three food crops per year instead of the sugarcane crop, so the amount of land being wasted should perhaps be considered to be three times higher. 1.2 million acres for ethanol in Argentina (times 3 crop cycles). Production of ethanol fuel for 2014 is estimated at 1.745 billion liters, and 300 million liters for biodiesel in the same year. In Canada, ethanol is principally made from corn and wheat, while biodiesel is mainly from canola. At 4100 liters of ethanol per hectare (see above), this implies a land use of 425,610 hectares or 1.05 million acres. 300 million L of biodiesel from canola oil is 276 million kg. At 558 kg/ha (498 lbs/acre), this implies a land use of 494,623 acres. 550 million L of ethanol in 2014 , using sugarcane as the primary feedstock. At 6,134 L of ethanol per hectare, this implies a land use of 89,664 ha or 221,559 acres. 1.2 billion L of biodiesel in 2014 , using palm oil as the primary feedstock. At a specific density of 0.92, 1.2 billion L is 1.104 billion kg. At 3,700 kg of oil per hectare per year, this implies a land use of 298,378 ha or 737,292 acres. For bioethanol and biodiesel combined, total land use worldwide is at least 155.47 million acres, based on 2014 estimates. At least several nations are planning on increasing their use of biofuels, implying that the acreage will continue to increase over the next several years. How much food could we grow on 155 million acres of cropland? We could use 55 million of the total 155 million acres to grow canola and produce about 24.75 million metric tonnes of peanut oil. That would meet or exceed the need for vegetable oil of all the 795 million hungry persons in the world. 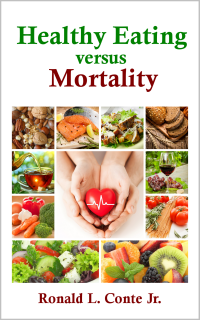 If the hungry had 5 tablespoons of veg oil (70 g) per day, in addition to their current inadequate diet, their total caloric intake would increase by over 600 kcal/day. For 795 million persons, 70 g/d of veg oil is 20,312,250 metric tonnes (20.3 Mmt). That veg oil, along with their usual staple foods, would be sufficient to remove most of them from the state of hunger. We could use another 50 million of the total 155 million acres to grow corn. Assuming a recent typical yield of 150 bushels per acre, we could produce 420 billion lbs of corn. That’s enough to give each of the 795 million hungry persons 23 ounces (1.44 lbs) of corn every day for a year. Of course, we could grow a variety of grains. Corn is used here as an example. The final 50 million acres could be used to grow a high protein crop, such as soybeans. At a typical yield of 40 bushels per acre, the yield would be 120 billion lbs of soybeans, which is enough to give each of the hungry 6.6 ounces per day for a year. Of course, we could grow a variety of protein crops, not merely soy. From the above examples, it is clear that the agriculture land used worldwide, solely to grow feedstock for biodiesel and bioethanol, is a sufficient amount of land and agricultural resources to end world hunger. The amount of food that could be grown on that land would be enough to feed the 795 million hungry of the world, especially since most hungry persons already have some food. They already have some staple food that provides carbohydrate and some protein. They particularly need vegetable oil and additional protein. But instead of feeding the hungry, we grow food to use as fuel for our vehicles. The world agricultural system is sick, and it needs to heal by focusing on feeding people, rather than making a profit. Posted on October 29, 2015 Comments Off on How much Farmland is used for Biofuel? 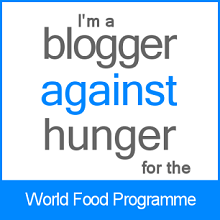 This entry was posted in food economics, hunger numbers. Bookmark the permalink.